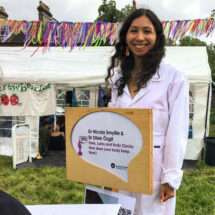 Nicola Smyllie participates in Soapbox Science at Strawberry Fair. Image courtesy of Nicola Smyllie. 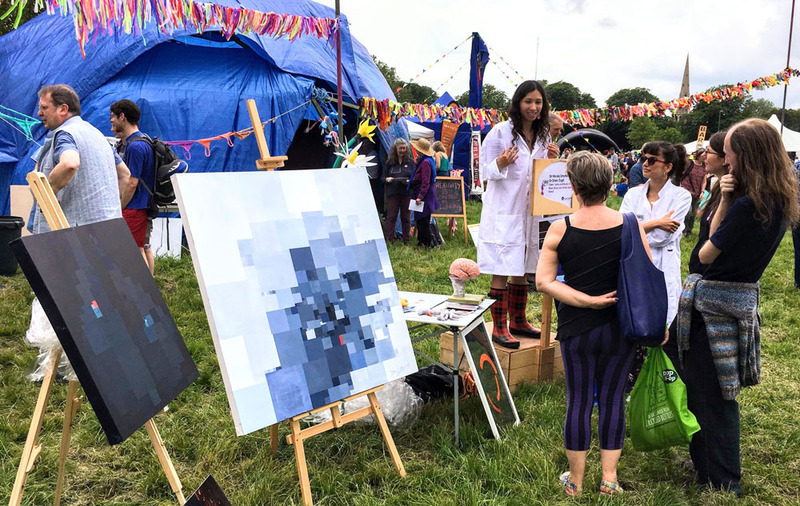 Nicola Smyllie, postdoc in the LMB’s Neurobiology Division, along with other leading female scientists from the region, showcased her science to the public, entertaining and captivating visitors at Strawberry Fair. 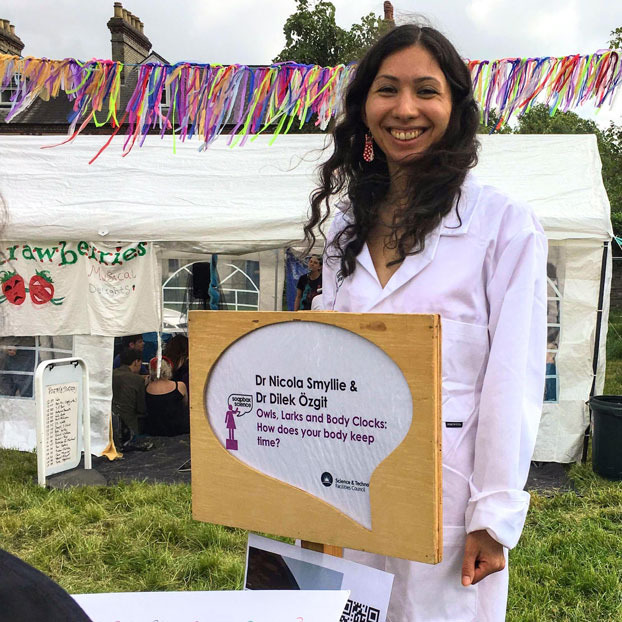 This year’s Cambridge Soapbox Science took on a new dimension with scientists partnered with artists with the aim of bringing difficult science concepts to the public in exciting, innovative and engaging ways. 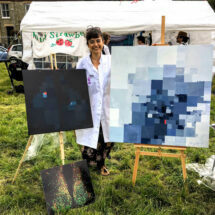 Nicola was partnered with Dilek Özgit, an electrical engineer who is also an abstract painter regularly exhibiting work locally and in London. Nicola invited Dilek to visit the LMB in May, to visit Nicola’s lab and chat about her research. 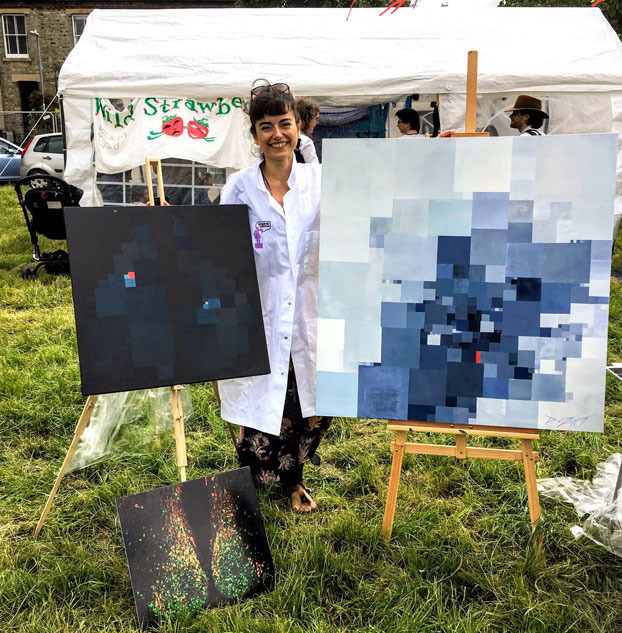 Dilek created a painting especially for the Soapbox Science event which was inspired by the brain slice imaging that Nicola does as part of her research. Nicola Smyllie talking to visitors at Strawberry Fair. Image courtesy of Nicola Smyllie. Dilek Özgit with her works of art. Image courtesy of Nicola Smyllie. Soapbox Science is a public outreach platform for promoting women scientists and the science they do. Public areas are transformed into spaces for learning and scientific debate, and scientists present their work with interactive props and collaborations with artists. Soapbox Science events take place throughout the summer at various locations around the UK, often including Cambridge.